Funfetti Cake Mix for breakfast! 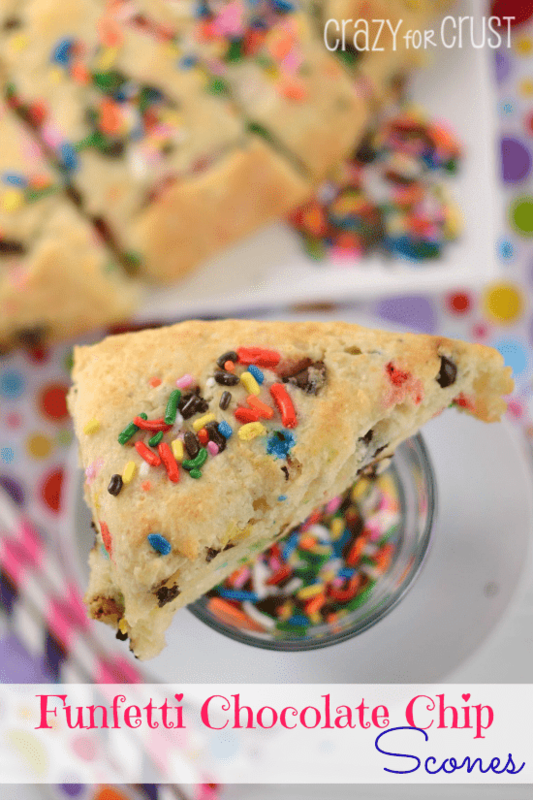 These soft and sweet scones are made from cake mix, chocolate, and sprinkles to get your morning started off right. Can you believe I’ve never made a scone before? Oh, sure, I’ve eaten lots and lots of them. But I’ve always been afraid to make them from scratch. Probably because, in my scone-eating travels, I’ve come across many a dry scone. 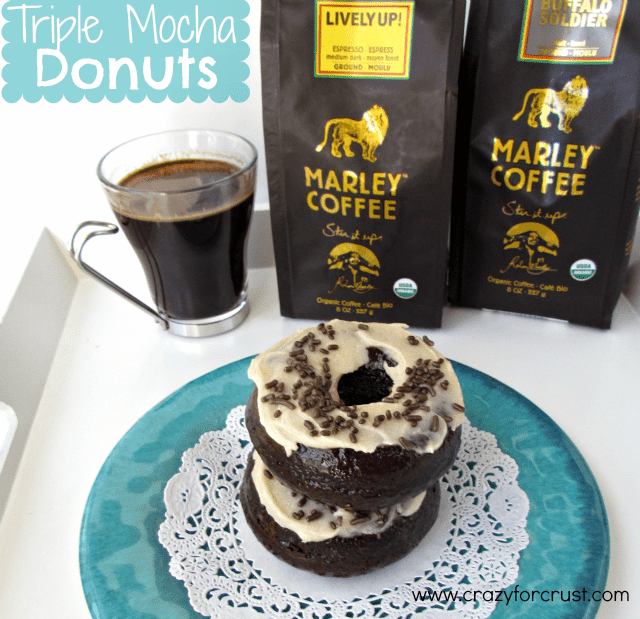 Ones that crumble like sawdust in your mouth; ones that no amount of coffee will fix. 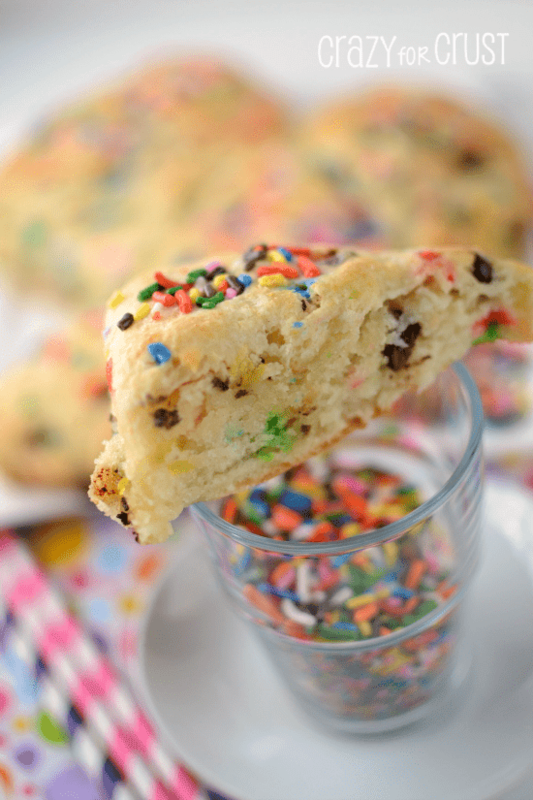 These Funfetti Chocolate Chip Scones? Are not those. These? These scones are perfect. I have my friend Ashton to thank for these scones. A few weeks ago she posted Red Velvet Scones, using a red velvet cake mix. When I was trying to think of something new to make for Valentine’s Day breakfast, I went to Pinterest and these scones jumped out at me. Obviously, I couldn’t do red velvet. She already did that. So, my mind goes where it always does when I think of cake mix: to funfetti. Funfietti cake is my absolute favorite. I mean, really, it’s just a yellow cake. But it has sprinkles inside, making it infinitely more fun and exciting than just a plain old yellow mix. I think that adding a cake mix to a scone recipe is just absolutely genius. I don’t know about you, but I have the hardest time finding a yellow cake recipe that isn’t dry. I had the same fear when I started thinking about scones. But something about cake mix in anything, like cookies or scones, automatically makes them soft and wonderful. There’s a reason why Pillsbury and Betty Crocker and Duncan Hines are huge companies: they found a magical solution. So why fix it if it ain’t broken? I mean, really. Look at the innards of the scone in that photo. They scream soft, dense, and delicious! And, because of the extra flour you add in the recipe, these aren’t too sweet. I like my scones sweet, but not overly so. If I wanted cake in the morning, I’d eat cake. These are the perfect mix of sweet and not-so-sweet. I added chocolate chips for good measure. Because really. If I can have a valid reason to eat chocolate for breakfast, I’m going to. Because I made these for Valentine’s Day, I shaped them into a heart. But you can make just a regular round of dough instead. 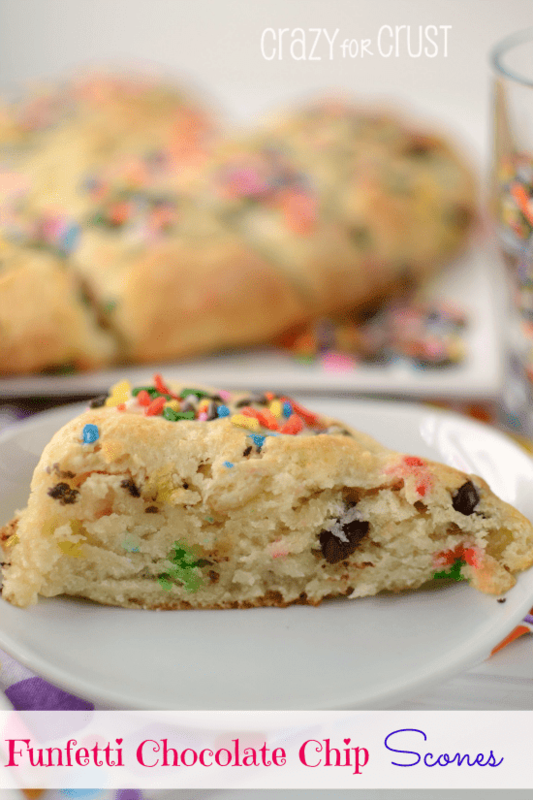 These Funfetti Chocolate Chip Scones start with a cake mix and result in a super tender and flaky scone! 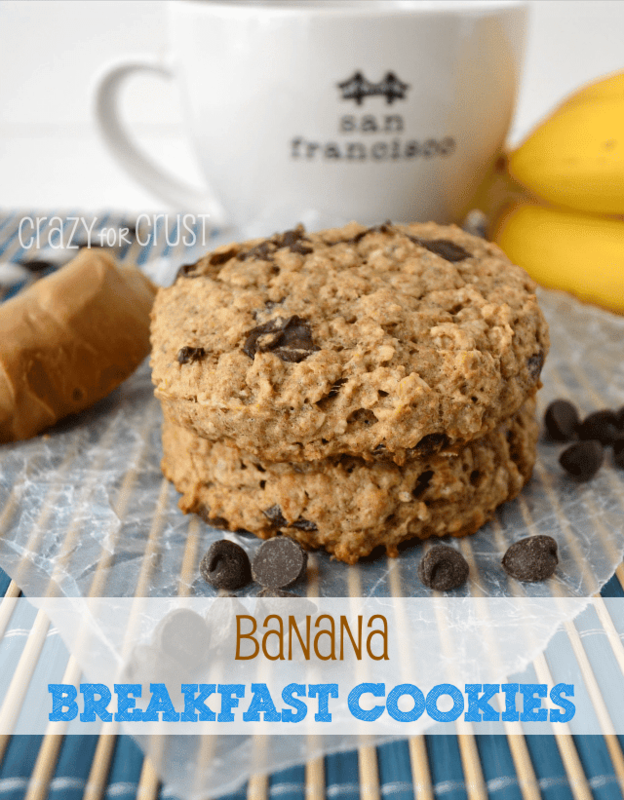 Add chocolate chips and sprinkles for a fun breakfast pastry! Preheat the oven to 400 degrees. Line a cookie sheet with a Silpat or parchment paper. Do not grease. Stir cake mix and flour in a large bowl. Add cold butter (be sure to dice it into small chunks first) to the flour mixture. Use a pastry cutter to work the butter into the flour mixture, until it is crumbly. Create a well in the center of the mixture and pour the milk in the center. Stir gently, keeping the dough in the center of the bowl, until the milk is incorporated. Stir only until the mixture comes together (there will be small chunks of butter still, and that’s okay). Stir in chocolate chips. Sprinkle a small bit of flour over the dough and flour your hands. Turn the dough out onto the prepared cookie sheet. Gently press the dough to flatten into a circle that is an 8 inch diameter. I made mine into a heart, so you can really make whatever shape you want. Use a greased knife to cut into wedges. Top with sprinkles and gently press them to make them stick. Can you use any flavor cake mix or does it HAVE to be the funfetti? Nope you can use any flavor cake mix you want! I made these! In theory they would be adorable, but I’m not sure what happened… 2.5 cups of dry, a stick of butter, and a cup of milk turned my mixture into a soup ?. I ended up trying to compensate with more cake mix and it just became cake batter. I don’t know why it was so liquid-y, did I miss a step?? Did you use 2 1/2 cups of cake mix? Or 1 1/4 cups cake mix and 1 1/4 cups of flour? The flour called for should help make the batter thicker.